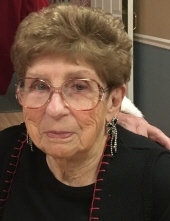 Helen A. Clonts, age 91, of Sullivan, Missouri passed away at 6:50 AM on Sunday January 13, 2019 at Life Care Center in Sullivan surrounded by her family. Helen Ann Roosmann was born on October 5, 1927 in Bourbon, Missouri, to William Roosmann and Luella (Bryan) Roosmann. She was one of six children. As a young lady, Helen worked on her family’s dairy farm in Bourbon, MO, and then later at Paramount Cap Factory, also in Bourbon. She was united in marriage to Charles E. Clonts, Sr. on Christmas Eve December 24, 1947. Charles and Helen celebrated 59 years of marriage before his death in 2006. Helen loved to spend time with family and travel both home and abroad. She also loved music, dancing, making family photo albums, playing cards and going to Tunica, Mississippi. She was a wonderful loving wife, mother, grandmother, great grandmother, and great great grandmother. Helen is survived by three children, Linda Klouzek and husband, Dean, of Linn, MO, Teresa Clonts and Barb Brinkmeyer of Eureka, MO, and Charles E. Clonts, Jr. and wife, Linda, of Sullivan, MO; eight grandchildren, Joe Eye and wife, TeAnn, of Sullivan, MO, Perry Klouzek and wife, Naomi, of Linn, MO, Jim Klouzek and wife, Tammy, of Linn, MO, Lacy Klouzek Williams and husband, Ian, of St. Clair, MO, Nick Klouzek and wife, Brandy, of Linn, MO, Abbie Clonts of Sullivan MO, Mollie Fancher and husband, Brian, of Cuba, MO, and Charles "Chad" Clonts, III of Sullivan, MO; two step grandchildren, Kristin Clonts and husband, Corey, of Sullivan, MO, and Briana Perry and husband, Brad, of Sullivan, MO; one brother, George Roosmann and wife, Bonnie, of Farmington, MO; twenty great grandkids, two great great grandkids, nieces, nephews and friends. She was preceded in death by her husband, Charles, Sr.; daughter, Debra Clonts Eye; her parents, William Roosmann and Luella (Bryan) Doyle; grandson, John Charles Eye; one brother, Bill Roosmann; and three sisters, Wilma Smale, Maxine Key and Dorothy Long. A special thank you to niece Diane Charlson of Sullivan, MO. Visitation will be held from 5:00 PM to 8:00 PM, Tuesday, January 15, 2019 at the Eaton Funeral Home in Sullivan, MO. Funeral services will be conducted at 11:00 AM, Wednesday, January 16, 2019 at St. Anthony Catholic Church in Sullivan, MO, with Father Paul E. Telken officiating. Burial will follow in I.O.O.F. Memorial Cemetery in Sullivan, MO. In lieu of flowers, memorials to St. Anthony Catholic Church of Sullivan, MO are greatly appreciated. All arrangements were under the care of Eaton Funeral Home of Sullivan and Bourbon, MO. To send flowers or a remembrance gift to the family of Helen A. Clonts, please visit our Tribute Store. "Email Address" would like to share the life celebration of Helen A. Clonts. Click on the "link" to go to share a favorite memory or leave a condolence message for the family.